A Small Ogre Update | Azazel's Bitz Box. Not really much to show this time really. Certainly not an exciting update! It’s been a bit slow going as I’m not really enjoying painting these Ogres because of the arms and weapons going across and obscuring the chests – I’m sure I’ll like painting the regular ones with 1-handed weapons eventually. Pretty sure I said that at least once before, but hey! Have put down a GW Ratskin Flesh base on their skin, given it a targetted wash of thinned down Coat D’Arms Red Brown paint, then blended back up (only on a couple so far) to the Ratskin Flesh. I notice that it’s not coming up especially stark or obvious in the pictures, but I prefer a more subtle/realistic highlight and shade on flesh, while I can go the other way on things like cloth when appropriate. I’ll give the flesh another layer of highlights (after I finish bringing them back up to the Ratskin tone) and see if they need a second highlight layer when I get there. Added some VMA Bright Brass with a bit of VGC Glorious Gold to the brass elements on their weapons. I was tossing up whether to give the armour some brass elements, but I really do like the way they look with just plain, slightly tarnished steel without any brass/copper/gold filigree. I’m not going to add rust to them as GW has done with many of their OK figures. I eventually went with blue for the tabards, since I wanted to avoid more reds and browns due to the fleshtones and brown pants I’ve given some of them. I used Reaper’s MSP Denim Blue, with a wash of AP Strong Tone (aka Devlan Mud) since I want the tabards to look dirty and haggard, rather than highlighting them and shading to a bright shade of blue. I figure that military-minded Ogres (and the Mantic ones are clearly quite uniform) would maintain their weapons and armour reasonably well, while not being too fussed about keeping their denims bright and clean. My Hoard O Bits order arrived with some banner pieces and such. So after I finish these six, I can finally (re)start on the Chariot(s) for the army. Mantic’s Ogre Shooters: Units 1 and 2. And Based. 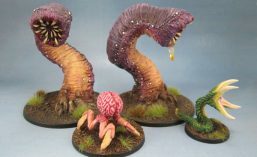 This entry was posted in Fantasy Gaming, Kings of War, Miniatures & Gaming, Ogre Army, Warhammer Fantasy - 9th Age, Work in Progress and tagged Kickstarter, KoW, Mantic, Ogre Shooters, Ogres, Warhammer, WHFB. Bookmark the permalink. ← Well, *that* worked well, didn’t it? So anyway, here’s some Ogres! I like the colors you’ve chosen. Those are pretty nice looking sculpts, I love Remy’s work. Remy is a fine sculptor, but there are flaws with these models. Aside from the cartoon-like proportions on these (heroic torsos, llittle legs with knocked knees and tiny feet) They’re a little over-detailed, which is not usually an issue, but it becomes one on those tiny feet. I guess I’ll have to paint some more after I finish these 6 ranged ones (and the *following 6* ranged ones for this army) and make a final decision then. 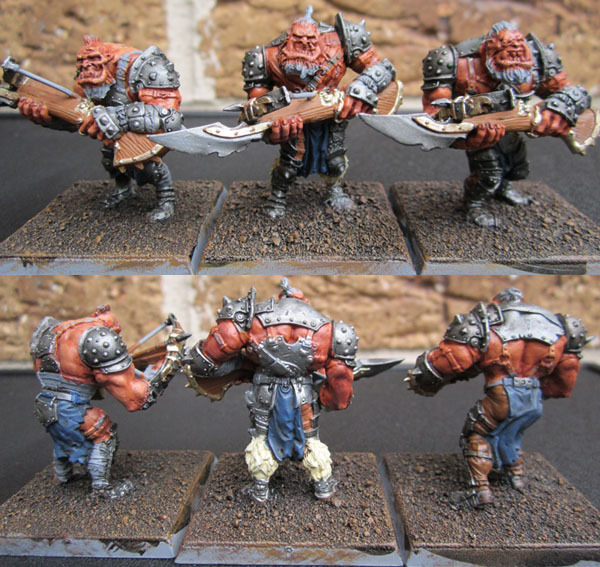 Pingback: Classic Citadel Ogres for Kings of War – Unit 2 – Olley’s Ogres | Azazel's Bitz Box. Pingback: Mantic Ogre Shooters in WIP-form. Batch two. | Azazel's Bitz Box. 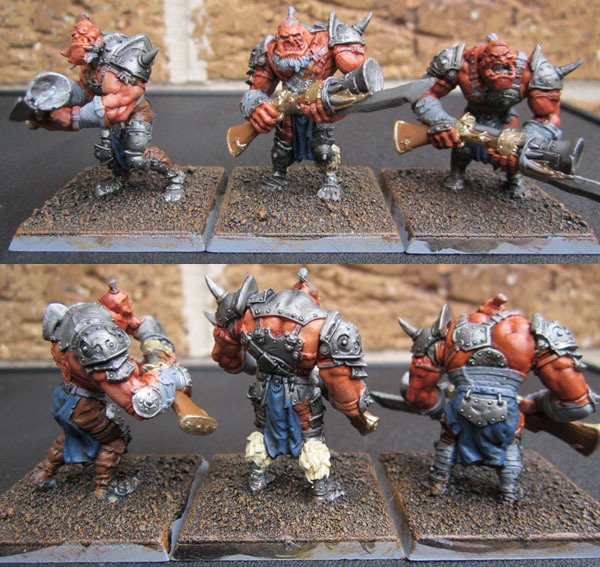 Pingback: Classic Citadel Ogres for Kings of War – Unit 3 – Golfag’s Ogres | Azazel's Bitz Box. Pingback: Classic Citadel Ogres for Kings of War – Unit 1 | Azazel's Bitz Box. Pingback: Mantic Ogre Shooters – Blunderbuss and Crossbows – Finished! | Azazel's Bitz Box. Pingback: Well, *that* worked well, didn’t it? So anyway, here’s some Ogres! | Azazel's Bitz Box. Pingback: Mantic Ogre Shooters – Units 3 and 4: 2013-2015 (a year on) | Azazel's Bitz Box.